The first alcoholic beverage was served in Ashes bar in 1849. Like many traditional pubs in Ireland it began as a drapery and general store, which was licensed to sell alcohol, this being secondary to the other business interests. In 1926 when the bar was passed on to John Kennedy’s eldest daughter, Hannah & her husband James Gregory Ashe, the bar’s name changed to ‘James G. Ashe’, as it remains to this day. Along with the bar James manufactured soft drinks, and in 1932 became an agent for Guinness. His grandson Thomas continues as the main Guinness agent for the area today. Thomas & Sinead inherited the bar in 2000, from Thomas’ father who ran the business along with his wife Kate for 40 years. Over the years Ashes has seen many famous faces pass through its doors. Indeed, Gregory Peck, a cousin whose grandmother was an Ashe from Dingle, visited a number of times, and his family continue to drop in when in Ireland. During the filming of David Leans’ “Ryan’s Daughter” in the early 70s’, Ashes became a hot-spot for both cast and crew, many of whom became quite partial to Kates’ Irish stew. More recently the cast and crew of “Far and away”,including Tom Cruise and Nicole Kidman, based themselves here. 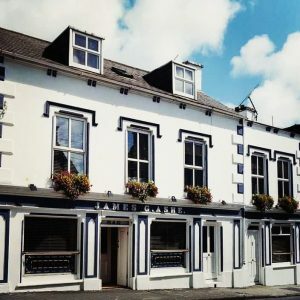 Ashes bar has evolved and developed over these years, and while you can still enjoy a good creamy pint of Guinness, it also offers a great dinning experience, focusing on fresh local produce.